I come home from work yesterday and look who is by the deck. I don't know. He looks a bit thin. No, I am not going to rush out and buy bunny food. Wheaton passed a law prohibiting people from feeding the wildlife. It's in relation to the coyotes that have taken up residence on the south side. People were feeding them which makes them less shy of humans and puts small pets at risk when they are let out into even fenced back yards. An ordinance isn't going to stop a raccoon from rifling your garbage, however. Last I knew, raccoons can't read. Wheaton does have a small feral cat population. There is a trap, neuter and release group working to manage this group. I'm not sure where this population is. 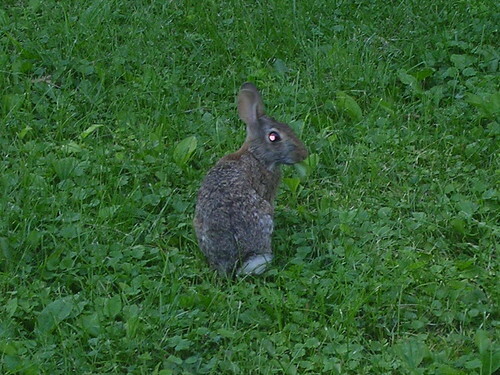 It's not in my neighborhood because the rabbits are very visible this year. They seem to know that my predatory cats are gone. I do wonder what these two would do if faced with legitimate prey. Would they know how to stalk a rabbit? No, we're not going to find out. I spent 23 years dealing with "Look what I brought you mom!" Right now, they are having a great time killing the moths and flies that come into the house.